The Prosthetic Users Group is proud to announce that the Mid-Ohio Valley, and surrounding area, now has six Nationally Certified Peer Visitors from the National Amputee Association. A big thank you and congratulations goes out to this group who stepped up to volunteer for the program. The program involved 8+ hours of training on Saturday, March 23, 2019. Juanita Mengel, a certified instructor from the National Amputee Coalition, traveled from Amanda, Ohio to teach the class. Students can be an amputee who has successfully adapted to life without a limb(s) for at least a year or a caregiver of an amputee. The application process requires references, a background check and a small fee. Both the students and instructor volunteer their time with their main goal of giving back to help new amputees. Peer visitors are invaluable to the new amputee. When someone loses a limb, they often struggle with how they can function and lead a normal life again. Peer Visitors, sent on behalf of the National Amputee Coalition, call on new amputees to help bring them hope. Peer support is vital to recovery. Most amputees who have experienced the gift of a peer visit report this visit changed their life. A visit can help them from being overwhelmed and depressed. They realize if he/she can do it, I can do it. Often the recovery process is a blur, but looking back, the amputee can distinctly remember the affect the peer visit had on their lives. The Peer visitor program was brought to the area by the Prosthetic Users Group of the Mid-Ohio Valley and hosted by Miller Prosthetics & Orthotics at their Belpre, Ohio location. The Prosthetics Users Group formed in October 2015 to help amputees meet and help each other adapt to life. 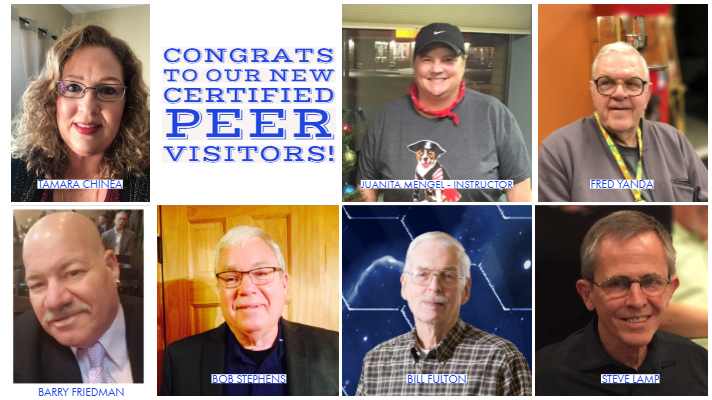 The support group has been discussing the certified peer visitor program for years and are thrilled to announce their first six graduates! If you work for a hospital or rehabilitation facility or have a family member or friend who is facing or has recently experienced an amputation, and are interested in a peer visit locally, call Nancy Miller at 740-421-4211. Another option is to go through the National Amputee Coalition Website at www.Amputee-coalition.org. This program is offered across the country. 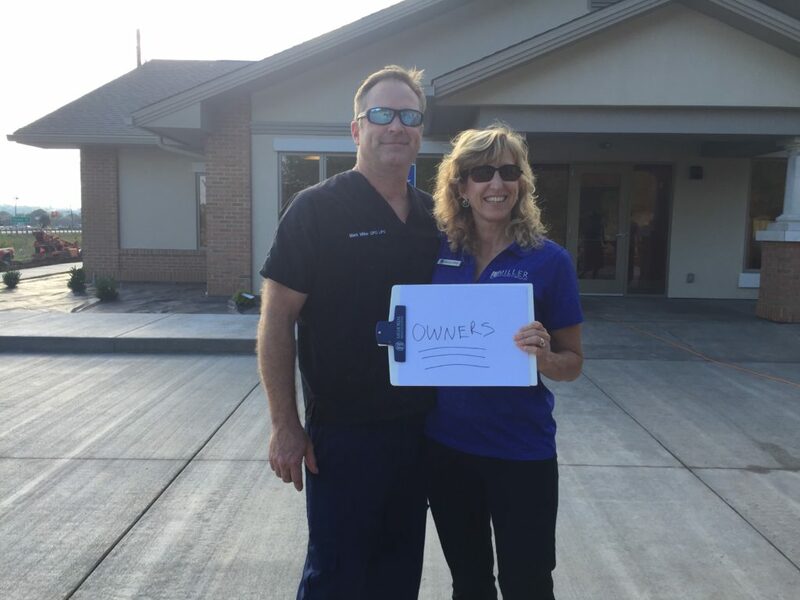 After two short years at our second location in Belpre, Ohio – we decided to build our own clinic on the other side of the highway. We broke ground on July 18, 2017. Below is our crew along with the key players on our team. 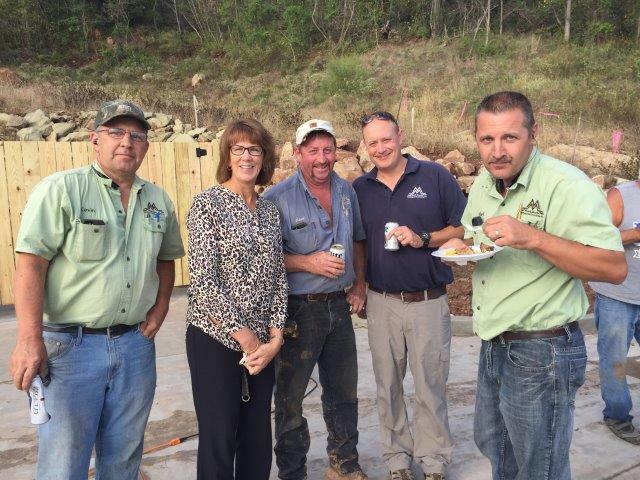 From left to right: Karen Waller, Executive Director Belpre Chamber of Commerce; Chip Wilson, Architect, J.H.Wilson & Associates; Alisha & Eric Morgan, Sustaining Development Engineering; Mark Mondo, Mondo Building and Excavating; Joyce & Mike Lorentz, Belpre Mayor; Nancy, Keating & Mark Miller, Susie Murphy and Dakota Wentz – all from Miller Prosthetics & Orthotics; Ron Cross, Belpre City Safety Service Director. Our move was spurred by the explosive growth of the medical industry in our area. We are fortunate to be part of that growth that offers new technologies and medical services right here at home in the Mid-Ohio Valley. We are proud to announce that our new building is complete! We met our October 31st deadline, beat it in fact. 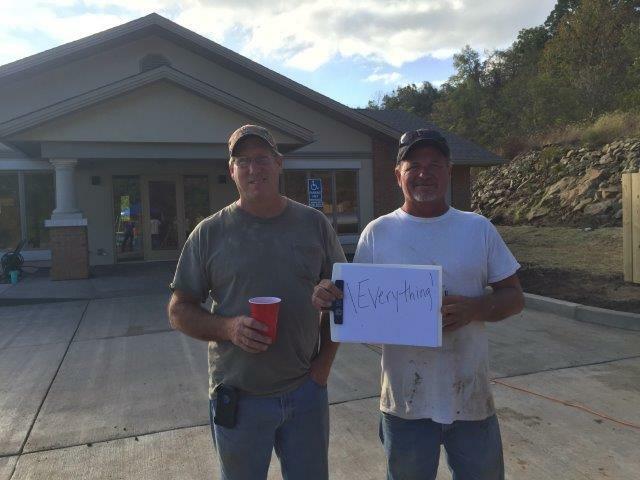 Our building was ready in less than three months on October 12, 2017. Crazy! After searching the valley, we assembled an amazing team of local companies that pulled off the project – ahead of schedule and under budget. From ground breaking to the occupancy permit in less than three months. 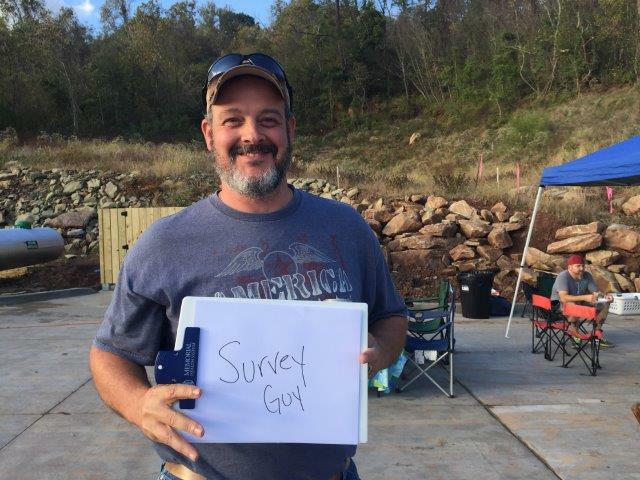 Our technician, Dakota Wentz, noticed a building going up fast in the area. He knew we were under a tight deadline and suggested we call them. And so we did. After interviewing several contractors and excavators, we found that Mondo Construction and Excavating shared our same vision for the land we owned. They are more than a construction company, they are developers and can read the layout of the land and deliver an amazing building. 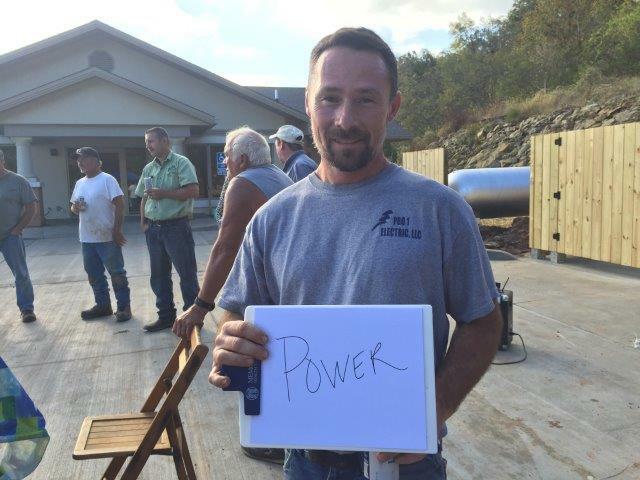 During the project there was always a flurry of activity at the location, and their employees and subcontractors worked around each other to get their jobs done. Not only was Mondo key to the project, but we were extremely pleased by the responsiveness, talent and professionalism of the many other teams. 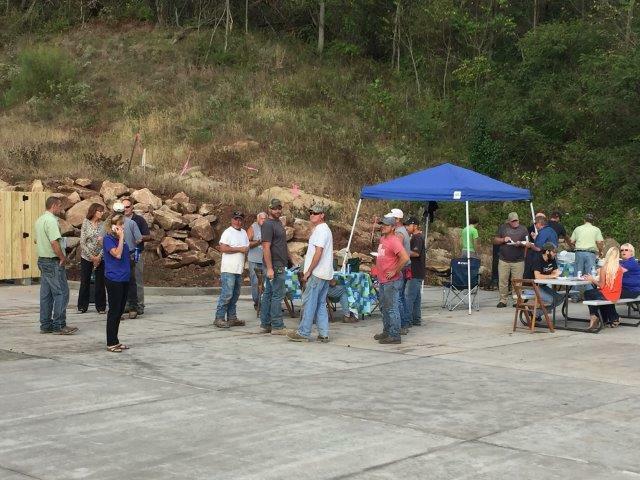 Two of the first on-site teams were new companies in the Mid-Ohio Valley. Jonathan Perkins surveyed the property with amazing turn-around time, and he kept expanding the survey as needed with next day turn -around in many cases. Eric & Alisha Morgan from Sustaining Development were the civil engineers on the project and helped us place the building on the land. They also worked hard and fast, and stayed connected to government officials and regulations. J.H. (Chip) Wilson was the architect who agreed to design the building in one month. As promised, he met his deadline – even after an engineering decision required him to flip and mirror the original plan. Tiera Arnold from T’s transformations has a magic paint brush and a great team. They painted every inch of the building inside & out. If you saw lights on after midnight, it was Tiera and her team. They worked on a tight schedule and in unison with Mondo and subcontractors so that workers could stay on track. Mondo subcontracted with many other local companies, and every one of them committed to and met their time line. With such a fast-paced project, communication was the key. Mark Mondo truly has a team of professionals that answer every phone call and text immediately. 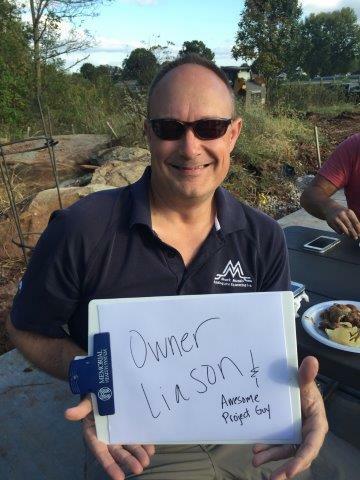 John Anderson, was the project manager and owner liason and made sure building supplies were selected, ordered and delivered as needed. 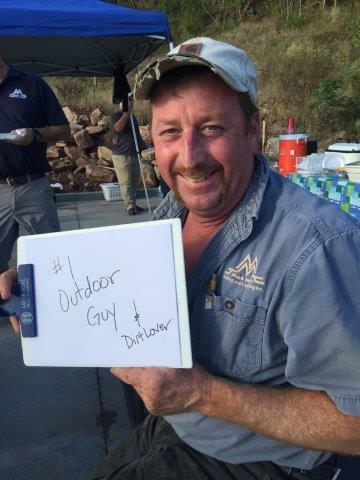 Mark Mondo excavated the site himself to make sure it was off to a great start. 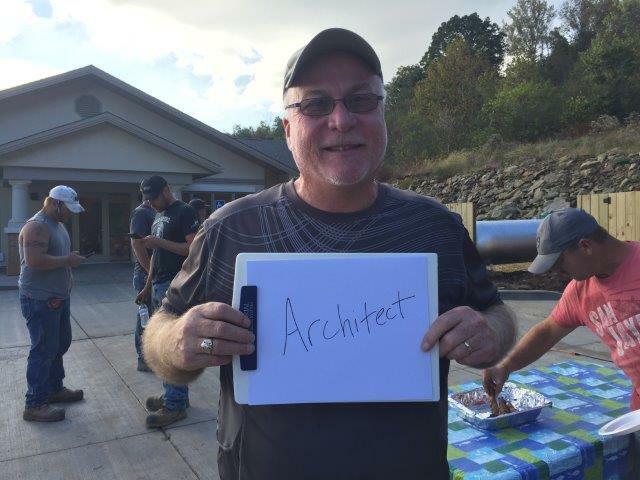 Kevin Guiler ran the building project on site, is very detail oriented, ran a tight ship and is respected by his employees. He was always available for a phone call or meeting, and responded to requests and changes quickly and meticulously. 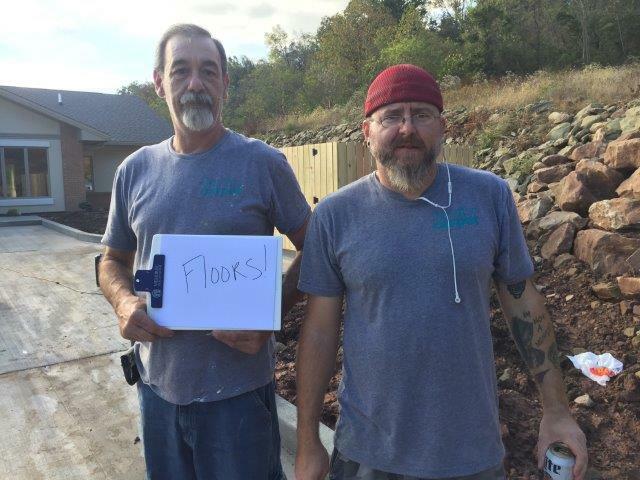 Chad Hendrickson ran the concrete and supervised everything outside of the building. He was usually found on the bulldozer transforming the land into a beautiful and functional area, including extra work for the city by replacing their sewage culvert. There were many other players behind the scene, like Mark Guiler, who made sure equipment and supplies were on-sight as needed. Mondo also kept county inspectors informed along the way so there were no surprises along the way. 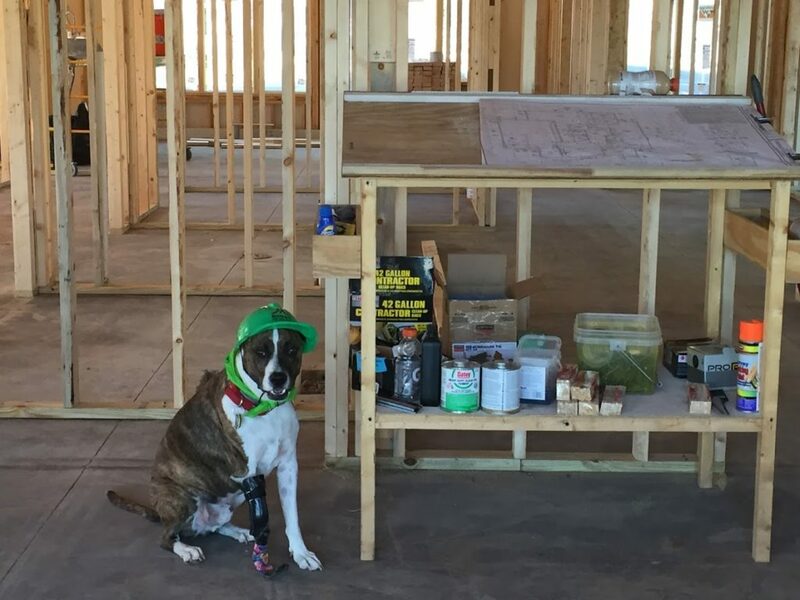 Keating, our three-legged certified therapy dog had his own hard hat and kept a close eye on the project every step of the way. 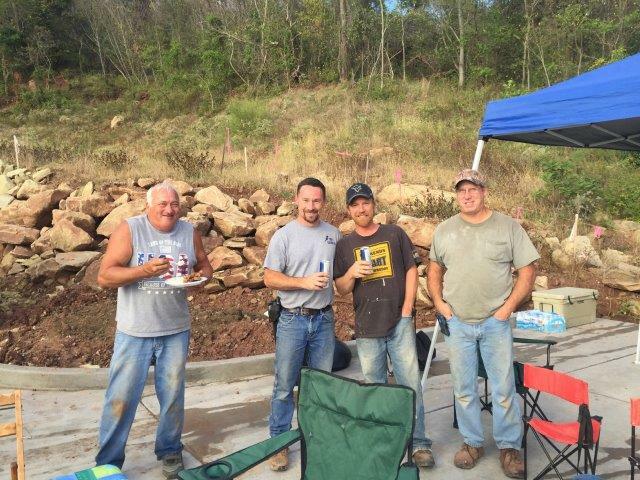 To thank the entire crew (including all subcontractors) for working so hard on this project, we had a barbeque on site on Thursday, October 12. As an added surprise, the inspectors came earlier that day and the building passed all of the final inspections! The City of Belpre, especially Mayor Mike Lorentz and Leonard Wiggins Code Enforcement Officer, have been very helpful in all steps. They are eager to see their community grow and do what it takes to get it there. 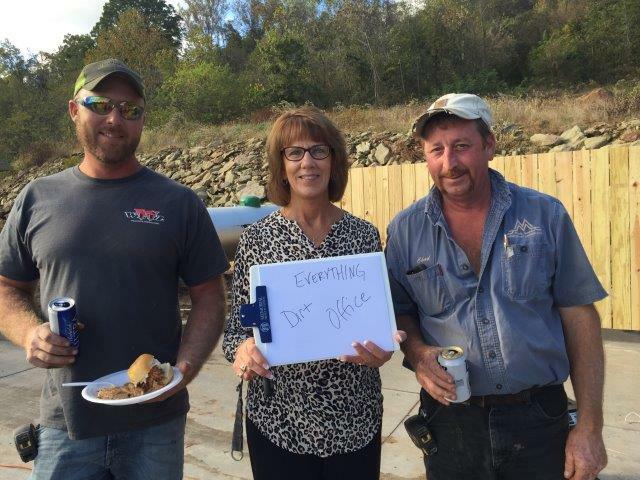 Karen Waller, Executive Director for the Belpre Chamber and other chamber members were also there for us, especially when we were searching for a location. We are very tied to the city of Belpre and proud to be part of that community. Our new building is located at 2354 Richmiller Lane, Belpre, Ohio 45714. This address was meant to be – Richard P. Miller is the name of Mark Miller’s father. … a lucky sign! We will also continue to see patients at our original location at 2601 Dudley Ave Suite 5A, Parkersburg, WV. We hope you can join us for the Ribbon Cutting with the Belpre Chamber of Commerce and Mayor Mike Lorentz and the Flag Raising Ceremony by the Belpre American Legion Post 495 on Thursday, November 2, 2017 at 10 am. We’ll have coffee and donuts to get your day started. The Grand Opening Celebration will be tied into our Five Year Anniversary and Christmas party on December 12, 2017 from 4-8 pm. We hope to see you there! Thanks again to everyone who helped pull off this incredible building project. We commit to serving the needs of our community for artificial limbs, braces, supports and all pediatric orthotic needs. We will continue to find smiles with Keating, our three-legged therapy dog, and build the limb lost community spirit with the Prosthetic Users Group who will meet at our new office on the second Tuesday of the month. 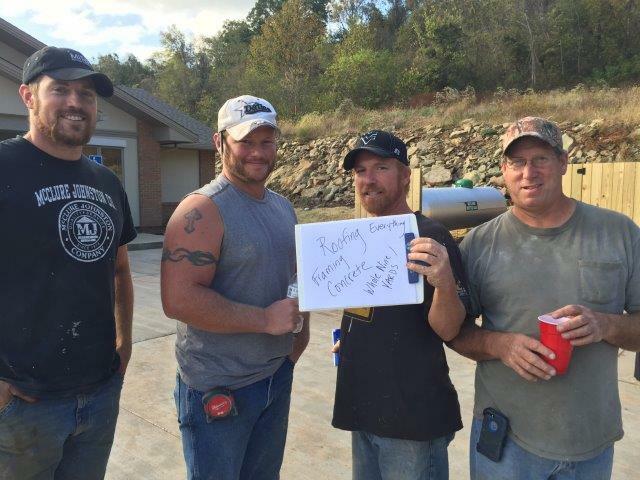 Thank You to our Builders and Subcontractors! Thank you to EVERYONE who built this beautiful building in three short months. What an incredible effort made by so many from our local Mid-Ohio Valley. It is still hard to believe what can transform from an empty, rocky lot to an easy-to-access, beautiful building. 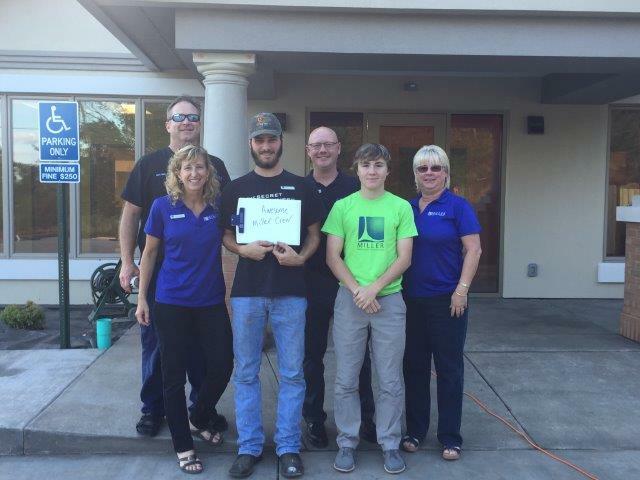 For everyone involved in this project, we thank you for completing our new place under budget and ahead of schedule! 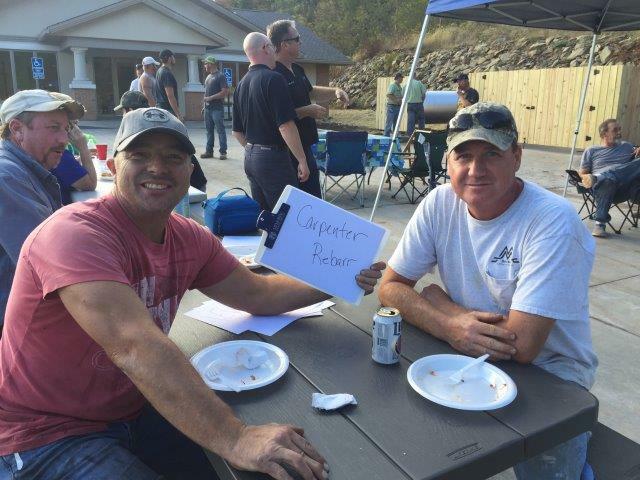 Before everyone wrapped up on the job sight and scattered to their next project, we brought them back together for a Thank You BBQ. 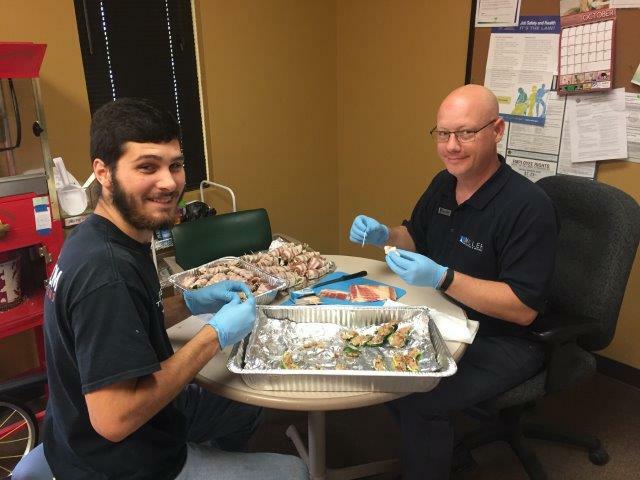 Employees from Mondo Building and Excavating along with their subcontractors and ours enjoyed smoked pork and bacon wrapped hot peppers in a tail-gate style party in the parking lot. We were also happily surprised to have the inspectors stop by and award us with the most coveted … Occupancy Permit! Check out the great pictures from this fun-filled event. 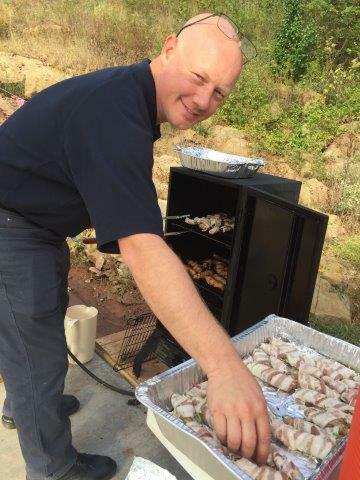 Sean Greer smoking the … hot peppers stuffed with smoked pork, cream cheese and wrapped with bacon. yum! There were many more involved that couldn’t make it to the cookout! 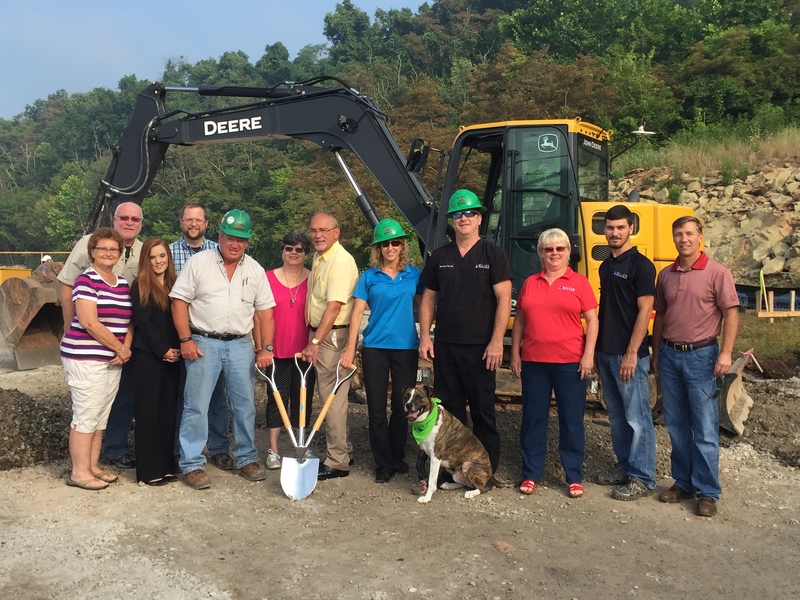 Eric Conrad from Elite Signs, Mike Reynolds from Reynolds Landscaping, Todd Hilverding and Laken Adams form Citizens Bank, Eric and Alicia Morgan from Morgan Building Designs, and Mayor Mike Lorentz and employees from the City of Belpre. Plus everyone else who helped along the way. 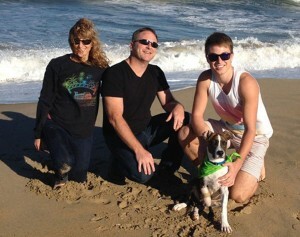 Thanks again from Mark & Nancy Miller! 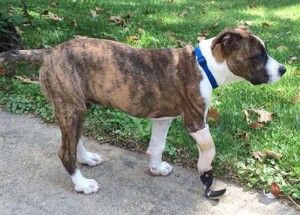 PARKERSBURG, WV (October 27, 2014) A puppy born with only three legs in Chattanooga, TN, now has a new home in Belpre, OH, with Mark and Nancy Miller of Miller Prosthetics and Orthotics, who adopted the mixed-breed puppy so they could continue to fit him with a prosthetic leg as he grows. A prosthetist in Chattanooga fitted the amputee puppy with his first artificial leg and then began searching for a permanent home while the puppy waited in a foster home to be rescued. 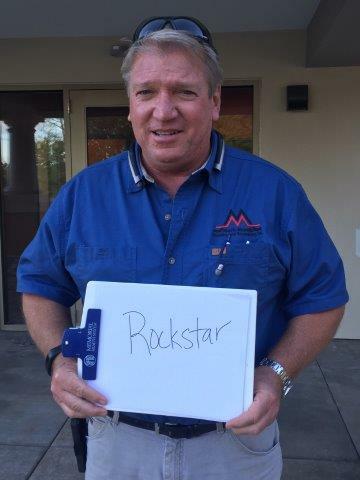 Enter Mark Miller, a certified/licensed prosthetist/orthotist who answered the Chattanooga prosthetist’s appeal. 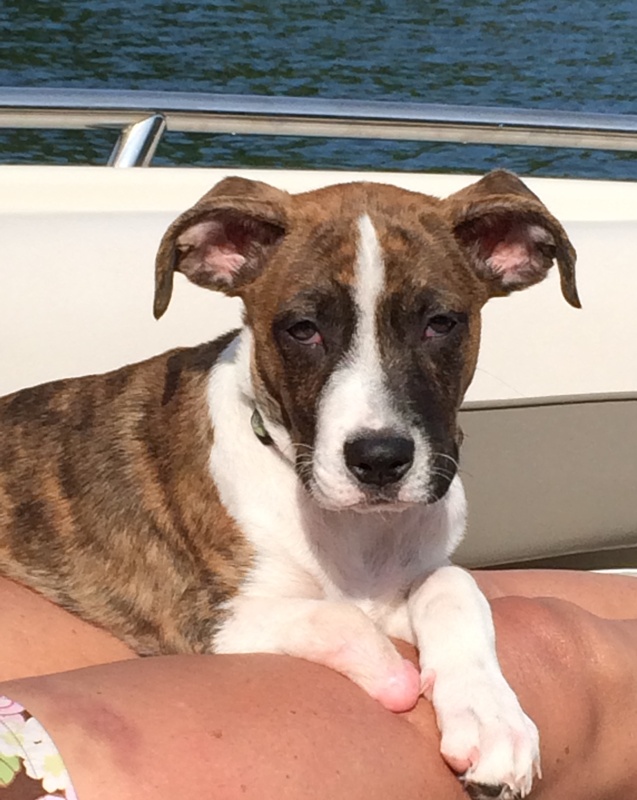 Once the Millers were approved to adopt the puppy, the local shelter arranged transportation to Wytheville, VA, where Nancy was waiting to take the Millers’ new puppy to meet Mark and their son Alex and enjoy a weekend outing at Summersville Lake in Summersville, WV. “We spent the next two days boating, camping and getting to know our new puppy, Keating,” Nancy said. Although Keating gets along pretty well with only three legs, he runs fast and plays hard like any other puppy when wearing his prosthesis. The latest leg made by Miller is hinged, so that it’s easy for anyone to put the leg on without pinching the skin. According to Nancy, the first time Keating chased a ball across a tiled floor while wearing his artificial limb, the “thump, thump, thump” of the plastic hitting the floor was adorable. In fact, they almost named him Thumper. Keating is a “congenital amputee” because he was born without a limb. Fortunately, he still has a joint in his right leg that helps the prosthesis stay on. Mark emphasized that the entire prosthesis is a work in progress because puppies grow so fast. Each new leg has functional improvements over the previous design. The current prosthesis is only three weeks old and needs to be replaced already. The design of the last foot worked well most of the time, but he had caught it on extension cords, ropes on a dock, and struggled to walk through fields of long, flattened grass at the Wilds during the Spartan Race. Mark replaced the foot and turned the open end around, which corrected the issue. The puppy’s new home was already adapted for a dog – it has a large fenced in backyard. The Millers’ previous dog had to be put down at age 13 early in 2013, but they had never adopted another dog until Keating came along. “It was worth the wait to find the perfect dog,” Nancy said. On his most recent adventure, Keating joined the Millers on a trip to Richmond, VA, to an Orthotic and Prosthetic Conference, where he was warmly greeted by the clinicians and vendors, and especially adored by a recent bilateral amputee who was at the show demonstrating his hi-tech knees. Keating also received a couple small socks from another vendor to help his prosthesis fit more comfortably. Outdoor enthusiasts, the Miller family often takes Keating boating, having him ride to shore on a knee board and cruise with Mark on a stand-up paddleboard. On his recent trip to Virginia, he saw the ocean for the first time. “I doubt he’ll be surfing anytime soon,” Miller joked, “he got sand in his prosthesis and was a bit intimidated by the splashing surf when trying to rinse off.” To read more about Keating, see more pictures, and watch a few videos – including the first “thumper” video, visit www.Millerpo.com and look for the Keating page. And, if you want to meet him in person, just stop by the office anytime. Miller Prosthetics & Orthotics, LLC provides prosthetic and orthotic services and fits diabetic shoes at Parkersburg, WV. The firm provides high-tech solutions for the best fit and service for all patients, striving to return patients to the activity level they desire – from walking and moving to running, fishing and hunting. Owner Mark Miller is a certified, licensed prosthetic and orthotic professional who has been helping patients walk comfortably and regain their confidence and dignity for over 25 years. 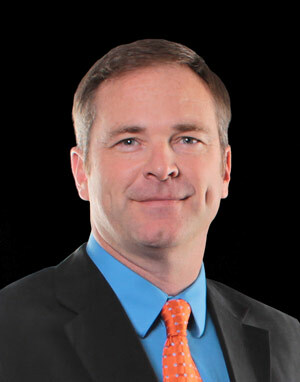 Mark was born and raised in Marietta, OH, has a Bachelor of Science degree in Industrial Technology from Ohio University and received his certificate in Prosthetics and Orthotics from Northwestern University in Chicago. He has been practicing in the Mid-Ohio Valley since 1991. Miller Prosthetics & Orthotics was established on Dec.12, 2012, by Mark and his wife, Nancy Miller. Co-owner Nancy Miller has a Bachelor of Business Administration degree in Finance and Statistics, and an MBA from Ohio University. The office is managed by Susie Murphy, who comes to Miller Prosthetics & Orthotics with over 25 years experience in the field. PARKERSBURG, WV (September 23, 2014) Miller Prosthetics & Orthotics is using state-of-the-art technology to deliver faster service and comfortable products to amputees in the Mid-Ohio Valley. The Parkersburg-based company’s high-tech theme extends throughout the business, not only for the materials used in artificial limbs, but also for the measuring, fitting and production of the prosthetic socket. Using custom software and mobile apps, Miller Prosthetics is able to run a paperless office to keep the workflow and information storage efficient and organized, enabling clinician and owner Mark Miller to focus more time on serving the patient. According to Miller, “All methods still have their own pros and cons, and it depends on the type of socket desired and shape of the residual limb.” One option for the active vacuum fitting technique uses an iPhone app to change the degree of vacuum to either increase or decrease the level of vacuum depending on the activity. All of these options are available and usable. “MPO is also actively looking at 3-D printing in-house to see how it can broaden the options in prosthetics and orthotics,” Miller said. One of the current MPO patients will soon be in a socket created by a 3-D printer. The 3-D printed socket is actually made in Ohio, and is one of the first fabricators to use this new technology. In addition to the socket, technology continues to improve all areas of the prosthesis. For example, the microprocessor knee that Miller may select for above-knee amputees, uses software to control and modify the function of the knee. This type of knee provides more functionality when walking, including a feature called “stumble recovery,” and better stability when standing. 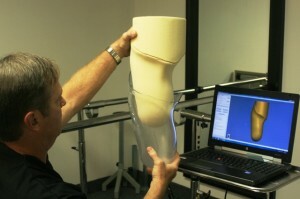 Miller Prosthetics also uses technology to improve communication with patients. Along with scheduling appointments, texting allows a patient to send a picture along with questions to Miller, who can then help solve the problem over the phone. Often that picture is worth a thousand words. Skype is used for long range consultations, and MPO uses an iPad app to streamline the process when working with patients. While in the room with the patient, Miller is able to enter patient information and photos of the residual limb directly to the patient’s file. Video can also be stored in the patient’s electronic file, which often helps communication with the doctor or third-party payer. Along with fitting amputees with comfortable prostheses, MPO provides all types of orthotic services such as fitting knee braces, back braces, ankle-foot orthoses, arch supports and diabetic shoes. MPO offers no-charge consultations for new amputees struggling to adjust to their new challenges, as well as existing amputees who are simply not comfortable in their current prosthesis. Miller Prosthetics is also available for in-service sessions to educate area nurses, physical therapists and other caregivers about how to treat patients with limb loss.